Goldman Sachs is dropping its plan to open a trading desk for cryptocurrencies, Business Insider reported Wednesday. It said the firm sees the regulatory environment as ambiguous. 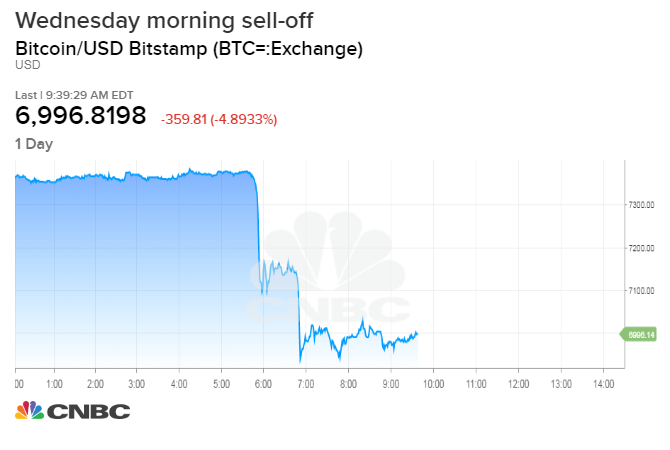 Bitcoin fell 5 percent Wednesday after the report, according to Coinbase data. The Wall Street bank has been considering the launch of a new trading operation focused on bitcoin and other digital currencies for the past year. Goldman executives concluded that many steps still need to be taken, most of them outside the bank’s control, before a regulated bank would be allowed to trade cryptocurrencies, according to Business Insider. Goldman would not confirm the report to CNBC, but instead repeated its only public comment on the matter, that it was still investigating the space for clients. “In response to client interest in various digital products, we are exploring how best to serve them in the space. At this point, we have not reached a conclusion on the scope of our digital asset offering,” Goldman Sachs said in a statement to CNBC. Brian Kelly of BKCM, a crypto hedge fund, said the report about Goldman was behind the negative sentiment in bitcoin Wednesday morning. “They were not a part of the ecosystem yet, but to the extent that they represent the institutional herd, this is a negative,” he said. The Securities and Exchange Commission warned last year that some of the coins issued in initial coin offerings could be considered securities, meaning trading them would have to comply with federal securities laws. Bitcoin bulls got a ray of hope that U.S. regulators might approve bitcoin exchange-traded funds from ProShares, but those bids were rejected. In addition to those denials, the SEC rejected crypto ETF plans by GraniteShares, Direxion and the Winklevoss brothers this summer.